KAI is one of the world’s foremost measures for problem-solving, teamwork and creativity. It has been in use for over 40 years, and is supported by a wide range of academic research from around the world. Typically, KAI Practitioners are HR managers, company directors, business consultants & trainers. The Kirton Adaption-Innovation Inventory is also widely used by academics in the fields of business, psychology, sociology and education. KAI can only be used by Certificated Practitioners. Click here for more information about Certification Courses. We have benchmarked the Kirton Inventory against many other leading personality measures. These include MBTI, 16PF and NEO. Find out more about Myers-Briggs and MBTI here. You can read more about KAI Relationships and Norms in the Resources section of our site. This also contains many articles by leading academics and management consultants. These give concrete examples of using the Kirton Adaption innovation Inventory in practice. KAI is very beneficial in building teams and identifying cognitive style. You can find many examples of how the Kirton Adaption Innovation Inventory can be used in specific industries. For example, among airline pilots or military personnel. You will find some fascinating articles detailing how the Inventory can be used in therapy, such as for vulnerable groups including teenagers. Over the past 40 years, we have sent out more than a million Kirton Inventories to consultants around the world, This makes it one of the most robust psychometric instruments available. 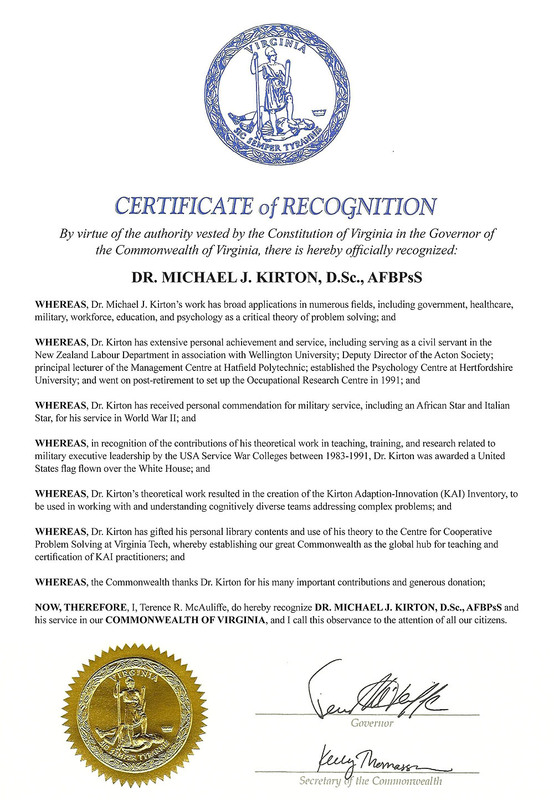 Dr Kirton’s work has recently been honoured with a special Certificate of Recognition from the Governor of Virginia, Terence McAuliffe. This rarely-bestowed award is in recognition of Dr Kirton’s work over the decades, and his contribution to education, psychology, the military, and government. Dr Kirton has gifted his archive to Centre for Co-operative Problem Solving at Virginia Tech, and is delighted that both he and Virginia Tech have received this recognition.